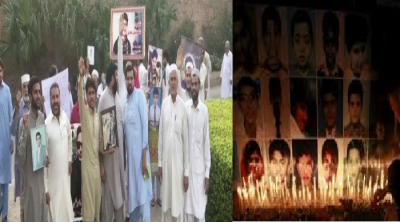 Peshawar (Staff Report): The parents of the Army Public School massacre’s martyrs protested against Pakistan Tehreek-e-Insaf Chairman Imran Khan on Saturday, demands to released inquiry report of the incident within the next two weeks. According to details, the parents of the APS massacre’s martyrs announced to hold demonstration in front of the Chief Minister House in case the inquiry report of the attack is not released within the next two weeks. The protestor parents chanted slogans against the PTI chief at the archives library in the school. President martyrs forum Ajoon Khan said that Imran Khan had said that the archives library will be named in the honour of the martyrs but no step was taken in this regard. The president of the committee said that the inquiry report of the incident wasn’t produced up till now, adding that the parents have filed a plea to gain access to information under the legal framework. The parents put allegations against Chief Minister Khyber Pakhtunkhwa Pervaiz Khattak and Imran Khan, and claimed that their children were dead because of them. It is pertinent to mention that a shattering massacre took place on December 16, 2014, where 147 people, including 132 schoolchildren were martyred in the deadliest terrorist attack in Pakistan’s history when terrorists stormed Army Public School in Peshawar Cantonment.